The Guns Above is not easy to describe. It’s sort of like a cross between steampunk and military fantasy, without any magic. It’s a military focused novel that takes place in a whole different world that includes plenty of airships. 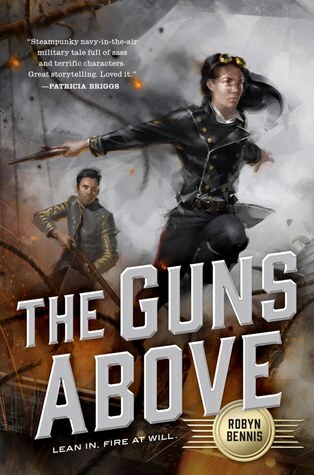 Let me preface the rest of this review by saying that I’m not that into military SFF. I can think of literally two series that I’ve liked enough to continue with. So in all likelihood, I’m not the main audience for The Guns Above. However, I do think that the military fantasy portions were well done. I enjoyed the airships a lot – Bennis includes enough detail about their operation to make them feel wholly believable. I heard the author mention that the setting was supposed to be non-Western. I would never have guessed by reading the book. The world building in general felt scarce, but what impressions I did get screamed English. There’s literally references to fox hunting and knighthood. The world came across as late 1800’s England with the names changed. Character wise, it was pretty easy to predict where the arcs would go. Bernat will eventually come around to respecting Josette’s competence, and Josette (and by extension the audience) will eventually come to see that Bernat is more than an aristocratic fop. While it was fairly well executed, that didn’t make it any less predictable. I liked Josette all right but never cared for Bernat. Outside of those two characters, no one else was the least bit developed. As I said before, fans of military fiction might enjoy this more than I did. However, I’m not planning on seeking out the sequel.